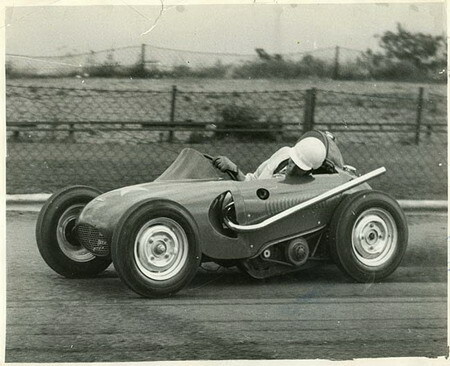 The ‘Atom’ project originated from Ronnie Green the promoter of Wimbledon Speedway who placed an order with the Company to build a prototype 500cc JAP powered small ‘dirt track’ style car. In the 50’s speedway was beginning to lose its appeal due to rather processional racing with little overtaking, and the winner usually being the leader after the first corner – nothing new! Ronnie Greene supplied us with a methanol tuned JAP speedway engine, along with a bike clutch assembly, and the requirement that the car should use 13” diameter Ford 100E wheels and tires. He held the view that midget car racing should look like the real thing rather than fair ground dodgem car. Sydney produced one of his ball point pen sketches along with a requirement that the wheelbase should be as small as possible which resulted in 64 inches. Construction of the car was carried out at the Encon Motors workshop at Fulham with the chassis based around a lightweight channel section which had previously been used for the Allard Clipper. The engine and clutch assembly mountings were part of the left hand side member. The rear axle was a solid shaft (Go cart style) with a removable hub on left hand side, so that sprocket size could be changed, both front and rear axles were offset from the cars centre line by approximately 2 inches to aid its cornering characteristics. The front axle was a fabricated beam axle (Frazer Nash style) with ¼ elliptic leaf springs and radius rods. The smallest Ford stub axles (E93A) were used, with specially made lightweight hubs with the steering being a shortened Ford Burman type steering box. No brakes were fitted, with the controls being accelerator and clutch pedals along with an engine ‘kill switch’. Before the body was made the car was taken to the Wimbledon Speedway track for Ronnie Moore to test. Once unloaded in car park it was given a brief run on the tarmac surface to do some basic checks before being tried on the track. After one explanatory lap on the cinders the speed was increased for a few laps, however due to ruts being left on the bends by the earlier practicing bikes the ‘Atom’ caught a rut and rolled. Ronnie Moore suffered a broken collar bone! One lesson learnt from the accident was that the cinder surface, of that time, needed to be prepared for car racing. Ronnie Moore went on to become the Speedway World Champion of 1955 even though he had barely recovered from his shoulder injury. My involvement in the project finished at this point in order that I completed my 2 years National Service in the Royal Air Force. 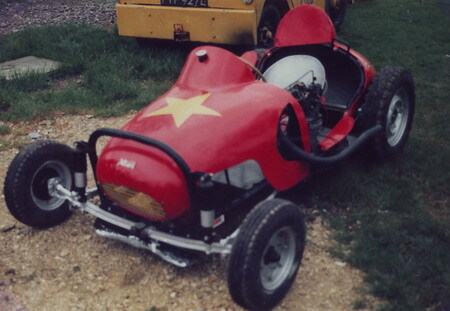 A second car was build and after strenuous efforts to develop Midget Car racing in the UK, it did not prove a success and the idea was dropped. On the www.britishpathe.com web site there is color film of the car complete with body being tested at Wimbledon Stadium by Cyril Brine. Both Sydney Allard and Ronnie Greene are also seen in this short film. During the early 80’s one of the two Atom cars could be seen outside a lockup garage in the Earlsfield area of London, however the owner was neither interested in the car or prepared to sell. John Pitney rebuilt one of the two cars, probably the one from Earlsfield and Ronnie Moore drove it an event at Wembley in 2000. The front axle of the John’s rebuild bears no relationship to the original design. Special thanks to Bob Blackman of www.anarchadia.co.uk for sharing the photos below. If you enjoy motorsports fiction, check out his books!